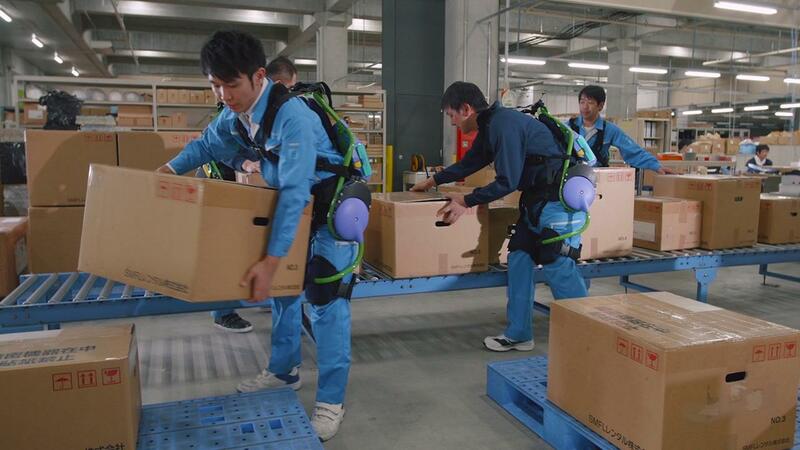 Power assist suits for industrial use have been developed by Activelink Co., Ltd., one of Panasonic's in-house venture companies. "Our mission is to help realize a Power Barrier-less Society by offering a helping hand during manual labor and at other worksites" said Hiromichi Fujimoto, President of Activelink Co., Ltd. "We are proposing robotics to help at these worksites, because there will always be a certain level of work that must be done by people, and these power assist suits can help reduce the physical strain during such work." 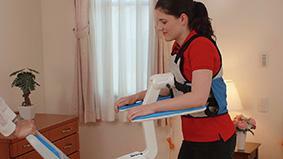 The AWN-03 was especially developed to provide lower back support. It automatically senses the user's motion when lifting and holding heavy objects, and sends a signal to the motors to rotate the gears. It also raises the user's upper body while pushing on their thighs, and as a result reduces stress on the user's lower back by 15kg. By mimicking human motion, the PLN-01 named "Ninja" assists the user's motion while walking and running, for instance hiking up steep mountain paths during afforestation. An upper body unit of the "Ninja" is currently being developed, which will help lift and carry heavy items. "As Japan has becomes an aging-society, Panasonic is aspiring to make its contribution by supporting the elderly and their families lead a comfortable life full of smiling faces and laughter" explained Hitoshi Sasaki, Assistant Director of Sincere Kourien, an elderly care facility run by Panasonic AGE-FREE. "There are many instances that can be straining to both caregivers and care recipients. Just moving from the bed to a wheelchair can be a very energy consuming both parties." Panasonic developed Resyone, a combination of electric nursing care bed and an electric full reclining wheelchair. Resyone's bed splits in half and one half transforms into a reclining wheelchair. Caregivers no longer have to lift residents from the bed to the wheelchair, so it reduces the strain on both the caregiver and residents and also helps maintains residents' dignity. Resyone became the world's first product to receive the ISO13482 certification, the new global safety standard for personal care robots. The Self-Reliance Support Robot assists the elderly when moving from the bed to the restroom, chairs etc. and empowers them to perform everyday tasks, such as using the restroom and watching television. This robot senses the slightest of movement and can predict how the elderly is doing based on the information gathered by the sensors. The motors in this robot only provide the level of power necessary, that is lacking, allowing residents to use their own remaining muscle strength and thereby prevents unnecessary muscle atrophy and strain. The robot also reduces strain for the caregiver as well, because they will no longer have to use their own physical strength. To help realize a better life, Panasonic will continue to develop robots that provide assistance in a wide range of fields that are safe to use and offers peace of mind.